The Capture of Guam was a bloodless event between the United States and the Kingdom of Spain during the Spanish-American War. 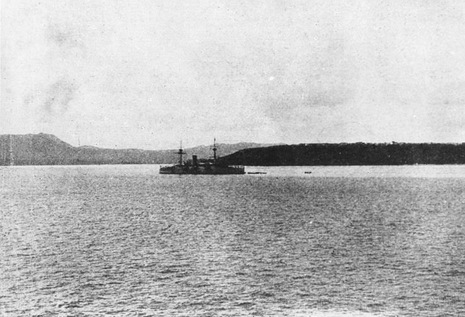 The United States Navy sent a single cruiser, the USS Charleston, to capture the island of Guam, then under Spanish control. However, the Spanish garrison on the island had no knowledge of the war and no real defenses. They surrendered without resistance and the island passed into American control. The event was the only conflict of the Spanish-American War on Guam. Guam, the largest island of the Marianas island chain, was under Spanish control since 1668, when a Spanish mission was founded on the island. As the Spanish American War approached, Spain apparently made no effort to reinforce this outlying post of its empire. As a matter of fact, the last communication that the governor of the island had with Spain was dated April 14, 1898, before war was declared between the two countries. The United States military apparently had an inkling of the situation in Guam. On June 4, 1898, the U.S.S. CHARLESTON, in company with the transports CITY OF PEKING, CITY OF SYDNEY and AUSTRALIA, left Honolulu enroute for Manila, P.I. Once at sea, Captain Henry Glass of the CHARLESTON opened his sealed orders. Within the orders was the directive for the cruiser and transports to proceed to Guam and take the island. It was anticipated that these actions "should not occupy more than one or two days."